22,399 — That was the total number of viewings of the Flying Tiger Flight 923 memorial web site made by individuals from all over the globe. That was the total through the end of December 2012. The website statistical monitor tracks all views by country of origin as well as the number so it is possible to determine from where the visitor interest is coming. The United States ranks at the top of the list, accounting for 8,760 (or 39%) of the 22,399 total viewings. Switzerland takes second place with 4,388 (19.6%), and Ireland is in third place with 2,113 viewings (9.4%). 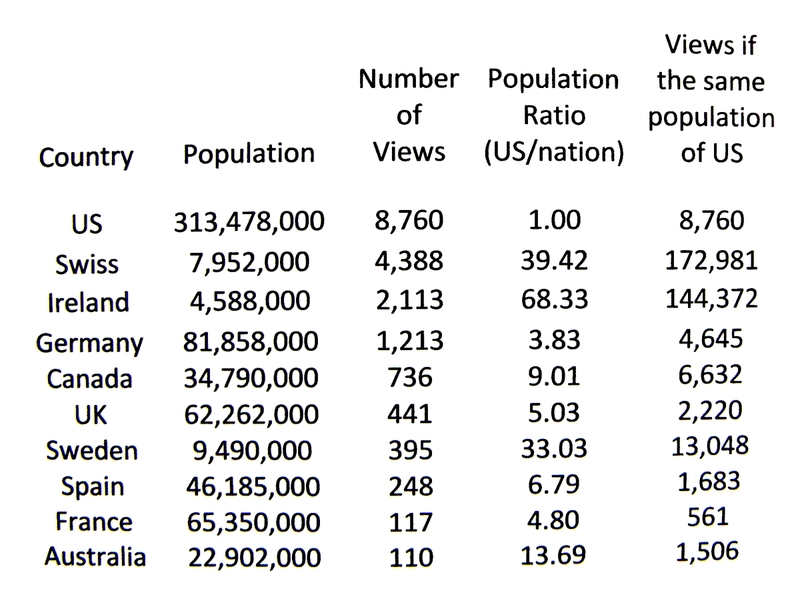 BUT, if one were to take the number of viewings as a measure of interest and weigh that against the country’s population relative to the population of the United States, Switzerland shows by far the highest level of public interest, with Ireland second and Sweden third. The extreme high level of public interest in Switzerland is due to several reasons. One is that the rescue ship, Celerina, belongs to a Swiss shipping company, Suisse-Atlantique. Many of the company’s employees present and past hold a great deal of pride in their country’s role in the rescue. The Celerina had a crew of 35 people at the time. Also, two Swiss National Public Radio reporters produced separate radio documentaries on the Flying Tiger crash. One was a full hour in the German language and the other was 15 minutes in French, both aired during popular listener times. Ireland’s high level of interest was due to the fact that the Flying Tiger ditching and rescue involved so many Irish people and was highly publicized in that country. Ireland claims the Flying Tiger ditching as “one of Ireland’s 10 most horrific air crashes.” Hundreds of Irish were directly involved in the operation. The apparent lower level of interest in the U.S. (relatively to population vs. views) can be accounted for by a number of reasons. Most important, there was very little publicity on the crash. There was a lot of global activity going on in late summer of 1962. Among those events were the Cuban Missile Crisis, the construction of “the death fence” between East and West Germany, and another military crash off the coast of Alaska that killed all 100+ aboard in the same week. More than 4,000 views occured during the first three months of this year, 2013. This entry was posted in Uncategorized and tagged air crash, aviation, Flying Tiger 923, Flying Tiger Line, national public radio, Super Constellation. Bookmark the permalink. Have u been napping since wonderful 50th anniversary? Looking forward to more flying tiger 924 stories!